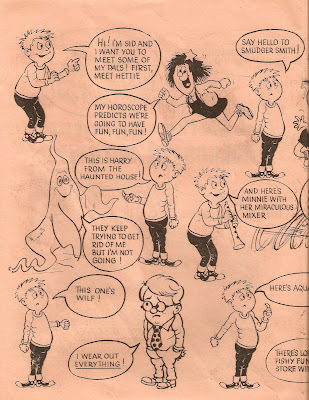 As many readers of this site will know, my favourite comic is Whizzer and Chips, so it's about time I covered the very first issue of this fantastic children's weekly! 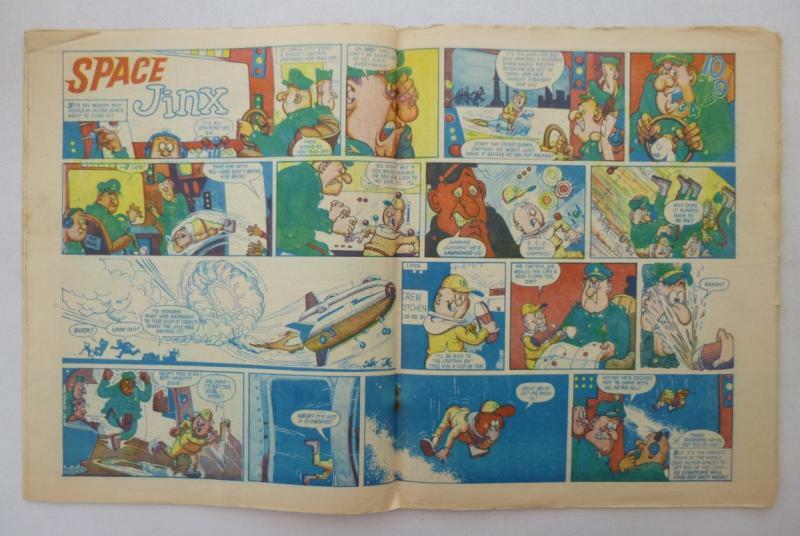 The first issue, dated 18th October 1969, actually went on sale on Monday 13th October. Whizzer and Chips was often advertised as a great way to beat the Monday blues (and undoubtedly, it was)! 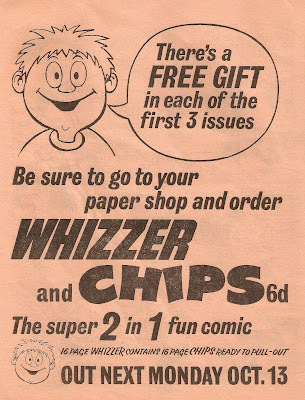 It cost 6D, and for that you got two comics - Whizzer and Chips, each of which was 16 pages long (although, of course, it was always considered one comic inside the walls of the Fleetway fun-house). 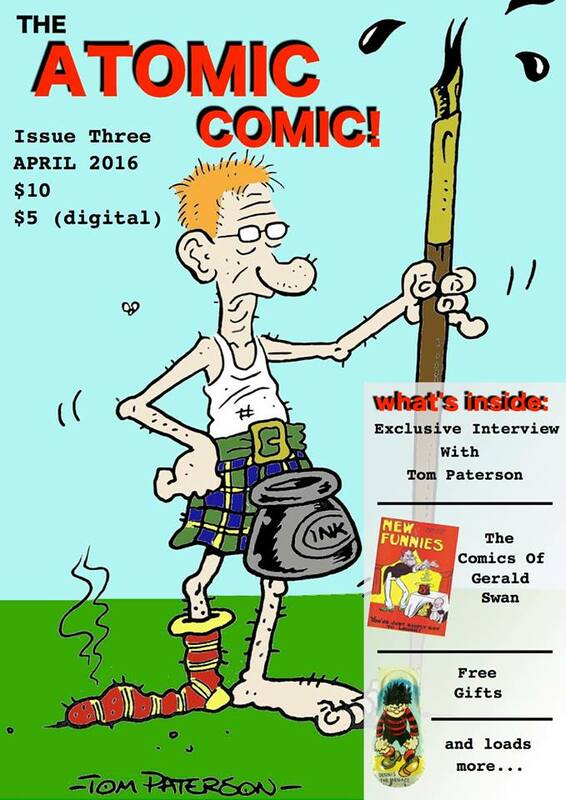 The comic was advertised with a short advert on T.V., apparently featured Ginger walking around saying something. I've emailed dozens of collections and film museums searching for a recording of this advert, but sadly it looks as though it has been lost in the vaults of time. Brochures were also given out in other comics and publications printed on their traditional pink paper to promote the comic, at least three designs were released for the first issue, and at least one for the two subsequent issues. Here are the scans from my flyer; I don't have the other designs. The first three issues came with free gifts (which I've posted here), but no. 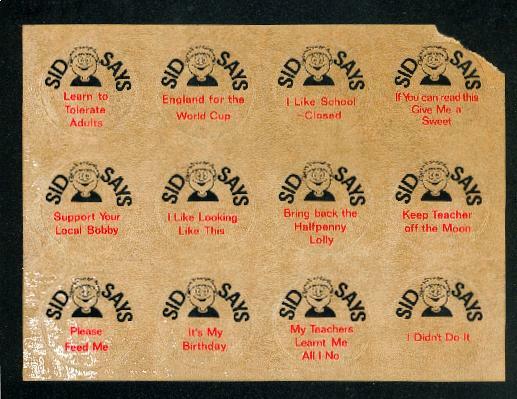 1 came with a set of "Twelve Super Stickers"; each one had something witty written on it. 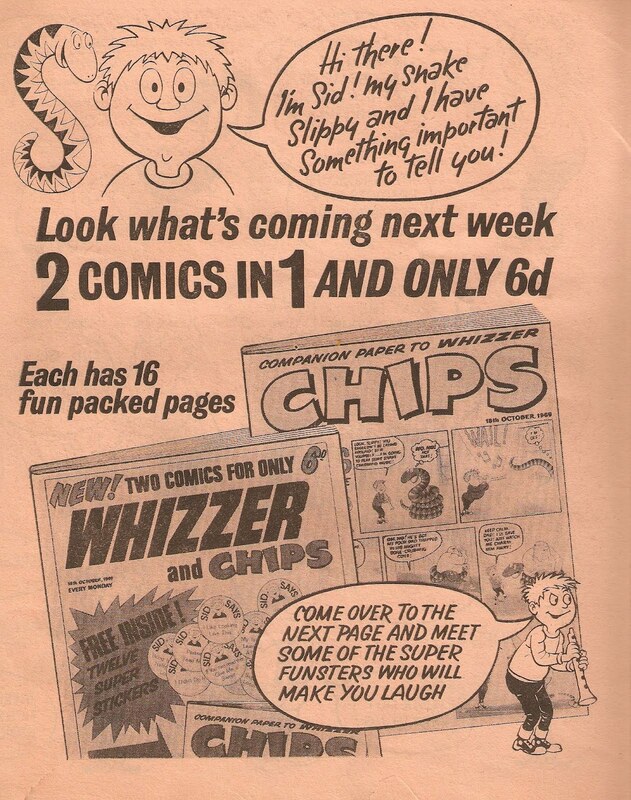 The two most notable artists for Whizzer and Chips are Mike Lacey and Terry Bave. 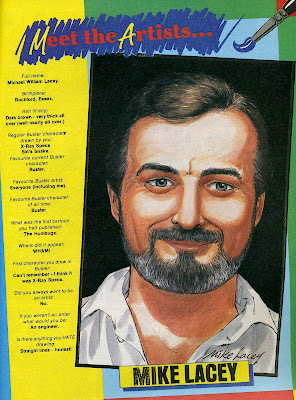 Mike drew five strips in the first issue (which would go up to six in the second), whereas Terry Bave drew seven! 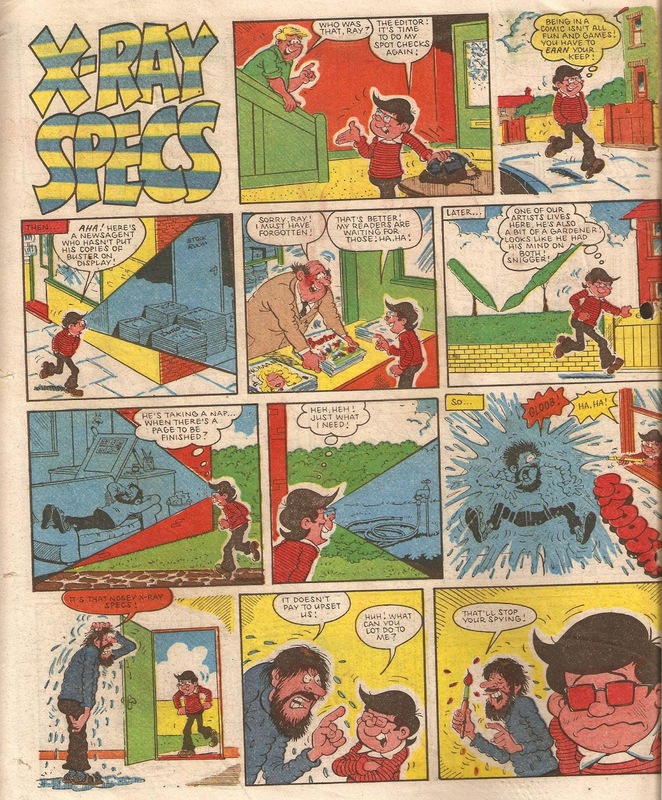 Terry's most popular strip in Whizzer and Chips was Scribbler, but that didn't start until 1970; it ended in 1973 because he was too popular for his own good! Whereas there's no saying which was Terry's most popular strip in this first issue, I'd probably say it was Me and My Shadow, followed by Little Saver (about a girl called Susie who would collect anything and everything) or Ginger's Tum (about a constantly hungry cat). 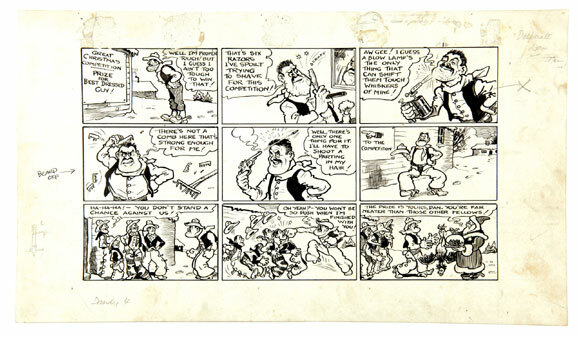 Mike Lacey on the other hand not only drew the ever-popular Odd Ball, but also illustrated the comics two main stars - Sid and Shiner. 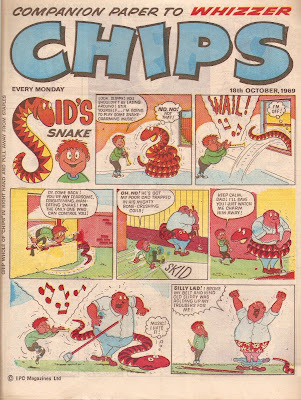 However, you may be surprised to learn that Shiner, a character which editor Bob Paytner said was based upon Biff after he got a black eye in one episode after trying hard not to, was nowhere to be seen within the pages of this first issue, instead launching the following week in issue two. 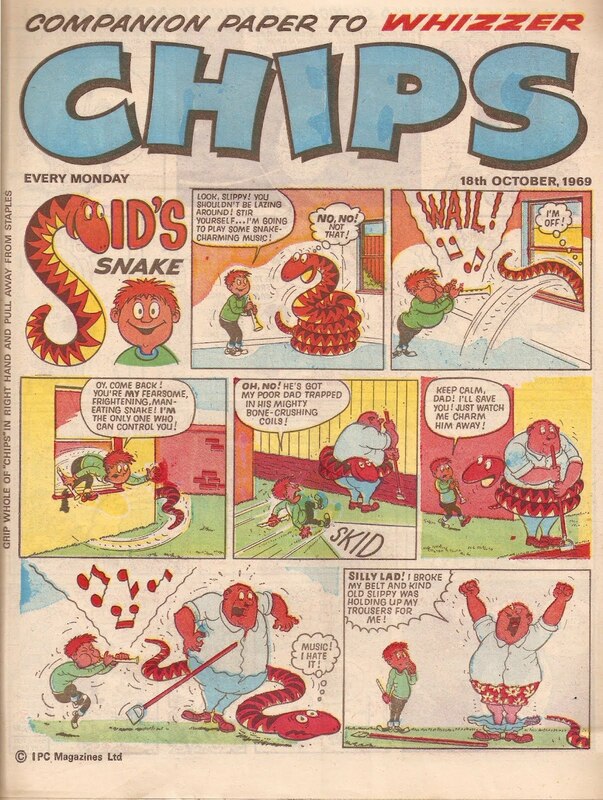 For this first issue Sid and Slippy betrayed the Whizz-Kids and appeared on the cover of Chips. Or, seeing as it's the first issue, maybe they betrayed the Chip-ites and quickly moved into Whizzer. Should we trust those two? 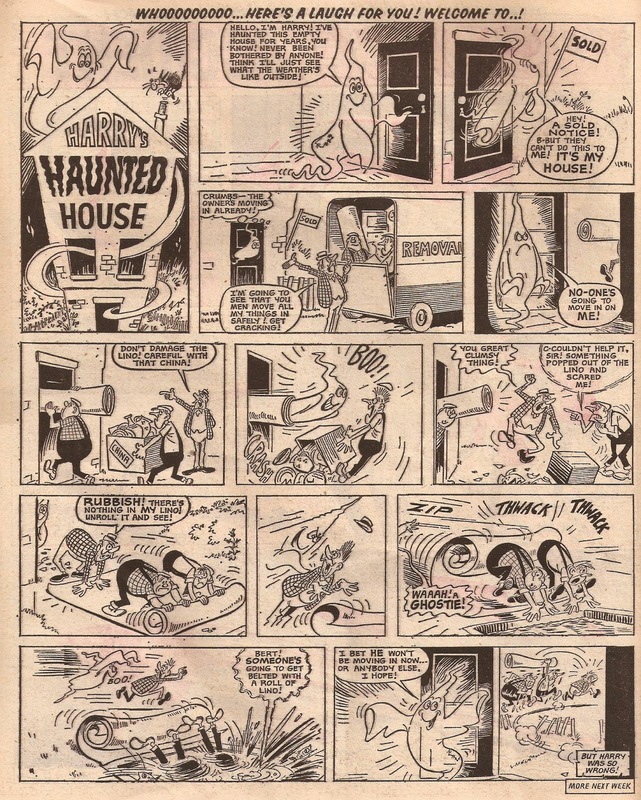 Also in the quality line-up was Reg Parlett, who illustrated two strips in this first issue, the most popular being Harry's Haunted House, a fun strip about a ghost who kept having to put up with people trying to move in or demolish his house. 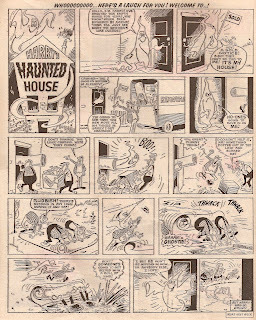 I'm not the only one who likes this strip, as Harry continued haunting for almost a decade, before the strip ended in 1977. Mike Higgs could also be found in there, illustrating an outer-space version the Bash Street Kids - Space School! I love Mike's artwork; it's very fun and unique and, although not as good as his work in the Power comics, is still nice to look at. 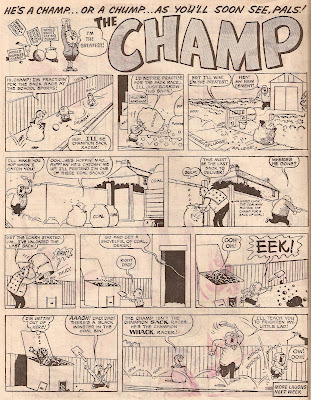 It's often forgotten that Leo Baxendale also had a page in there in the early days - Champ. He didn't draw the story for long and was taken over by Colin Whittock, who would do a fantastic job ghosting his style for many years. It wasn't until Jack Edward Oliver came along in the late 80's that Champ changed his look. In his first few strips Champ would have a long pointy nose, but that soon changed to a button nose. Whizzer and Chips also had a selection of adventure strips. 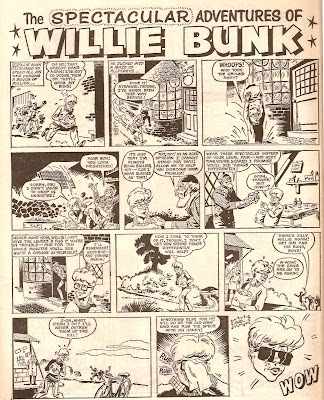 Kings of the Castle by Mike White, The Space Accident by Ron Turner and The "Stealer" by Tom Kerr are all fun strips with good plots, but my favourite is Frank McDiarmid's Willie Bunk, a tale about a kid who was given a magical pair of specs by an old optician. 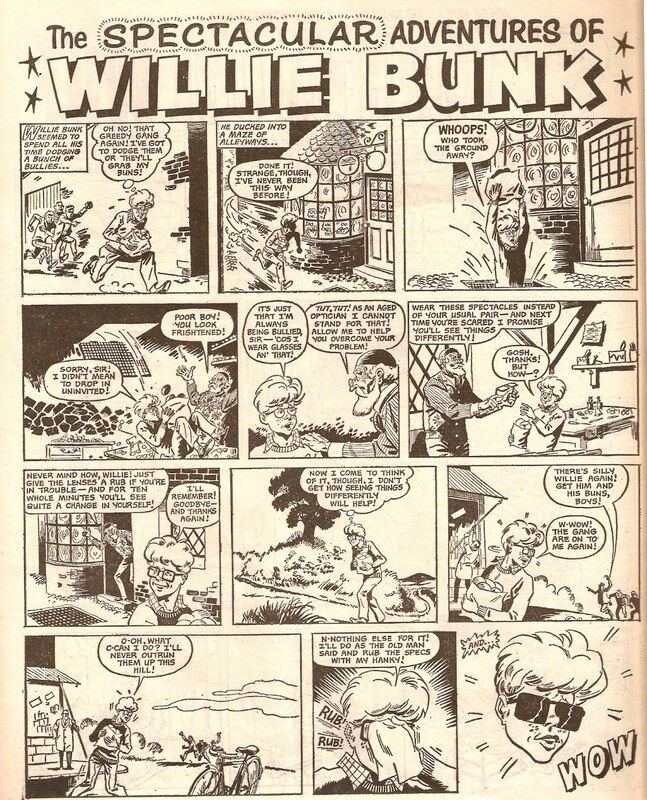 One feature I like about this comic is that whenever you see what Willie is seeing through his specs it's in red. A good feature that helps this already strong strip. 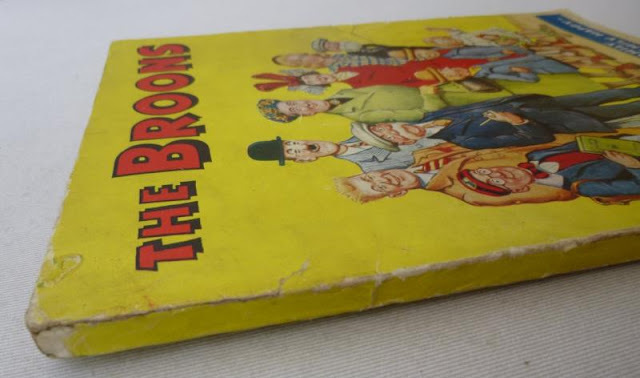 The reason Whizzer and Chips is my favourite comic is because after buying the Beano for about a year I asked my dad what comics he used to read when he was a kid. 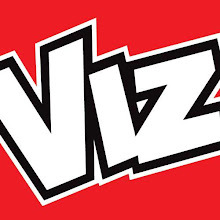 His answer was Whizzer and Chips, and thus I was introduced to the comic! My dad had been reading it from issue one to around the mid-1970's (one of the last comics he bought was Whoopee no. 1), but sadly had thrown out all of his issues long ago, the free gifts used even before that. 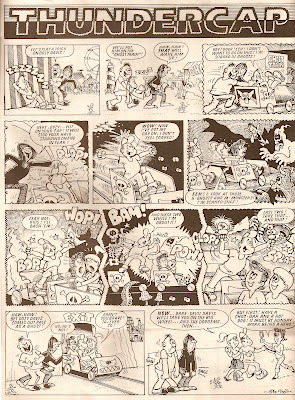 Several years later and the internet introduced me to the five power comics, and slowly I was drawn towards this darker (in a way) humour by the likes of Leo Baxendale, Ken Reid and Gordon Hogg. Although I only own one issue of Wham (no. 4 - which isn't even a power comic) and the 1968 Wham annual, I've seen a lot of pages on the internet and have fallen in love with the comics, my favourite been Wham, which had a brilliantly bright and attractive logo. Although Whizzer and Chips is still my favourite comic, I'm gradually falling for Wham. 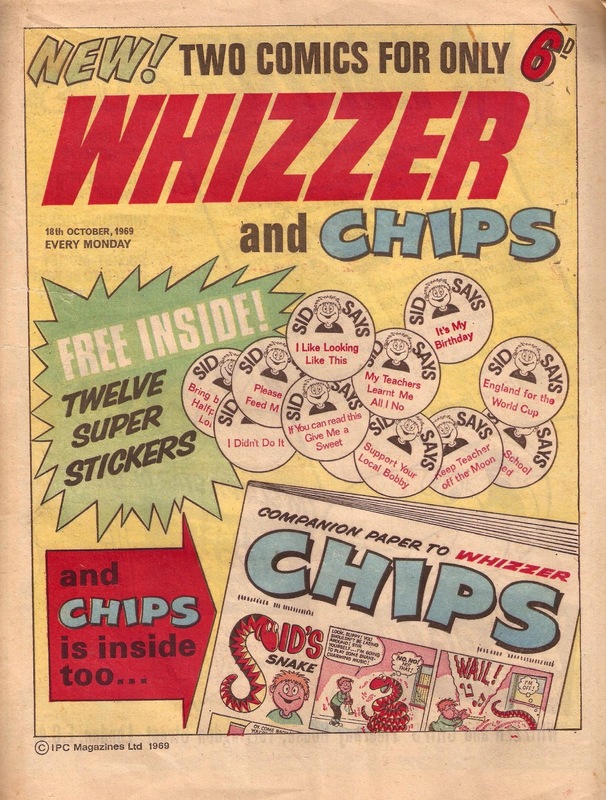 Whizzer and Chips' two-in-one gimmick paid off, and for 21 years it competed alongside the Beano and Dandy. 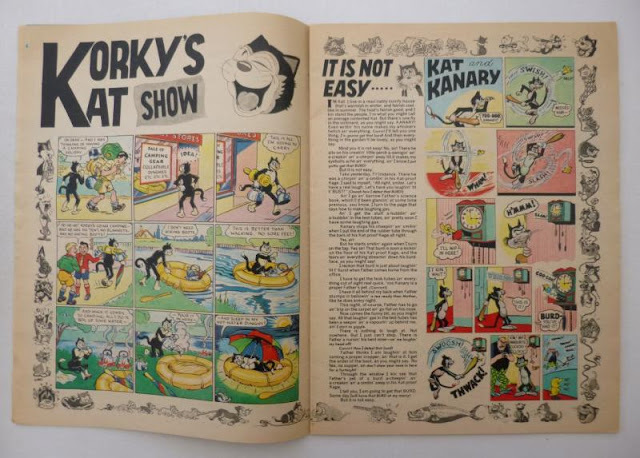 The idea was so successful that several copies appeared in the 70's - Shiver and Shake and Score 'n' Roar are the only ones I can think of - but I'm sure there's a third one - can anyone help with that? (Was Donald and Mickey a two-in-one?) Either way, the idea never took off again, with all the other two-in-one comics having very short runs. Over the years four titles combined into it - Knockout in 1973, Krazy in 1978, Whoopee in 1985 and Scouse Mouse in 1989. 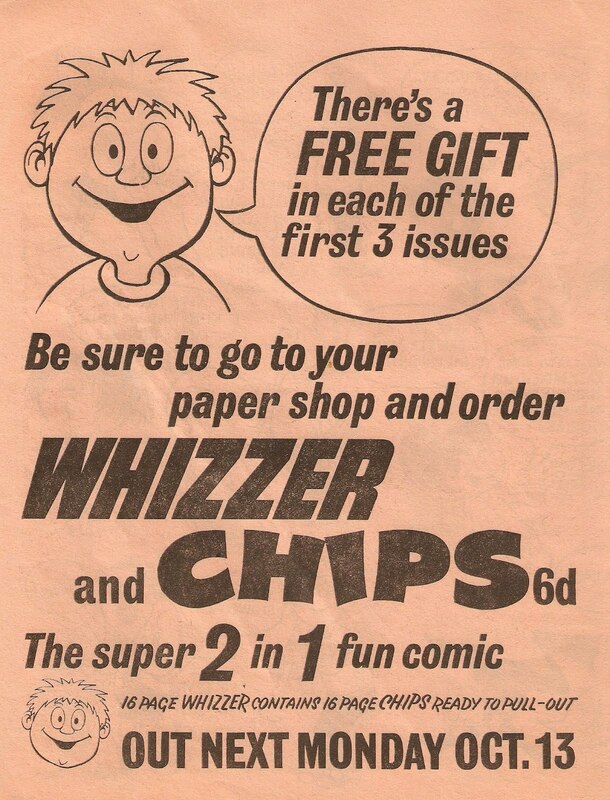 You could even say it went through a fifth merger because in 1990 Whizzer folded into Chips (or vice-versa). 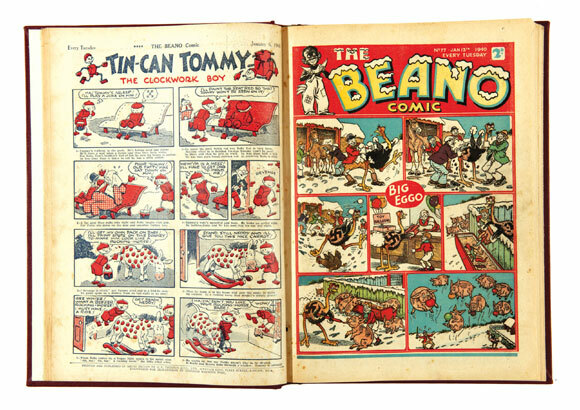 Incredibly, and for possibly the only time in comic history, a comic actually merged into itself! 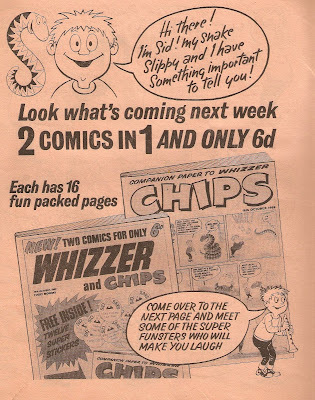 The title was obviously failing though, and Whizzer and Chips merged into Buster in 1990. Since I live in New Zealand I like to do my bit to support the (rather small) New Zealand comic industry. When Faction was launched earlier this year, I quickly grabbed a copy from a shop in Wellington, and I loved it. I'm eagerly awaiting the next issue, which is due to come out later this year. Damon Keen, the creator of Faction, said: "We're planning on two issues a year - but that will be dependent on the quality of the material we get. We only want to go to print once we've got a copy we're really happy with!". So, where am I going with this I hear you ask? 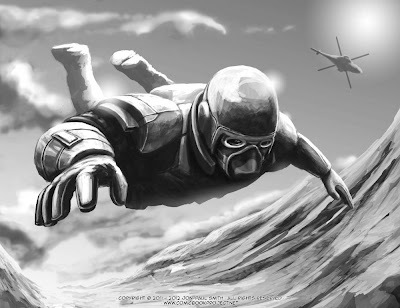 Well, that brings me nicely to the image at the top of this post - Comic Book Project. An amazing panel - wonderful perspective! 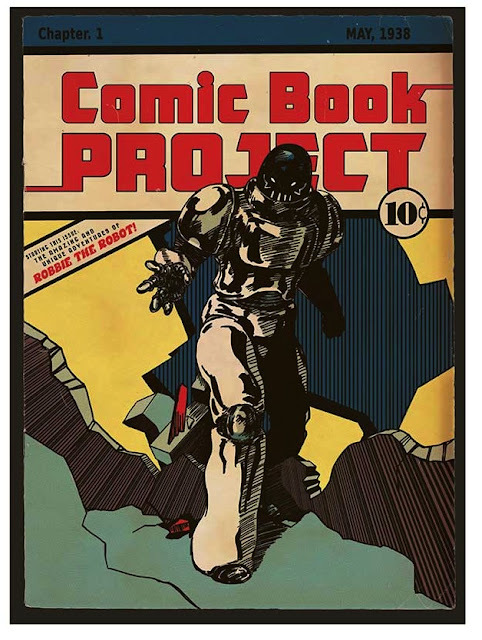 The artwork in Comic Book Project is by Jon-Paul Smith, who also wrote and published the comic himself. Issue #0, which is out now for $15 (around £7.50), shows the first three chapters, with the title pages in full colour, which is what Jon says he hopes the final graphic novel will look like all the way through. The final novel is expected to be all finished and ready for shipping by December, and will cost $60, or around £30. The story itself is about an outbreak of a deadly disease named the Titan Virus, which was supposed to be a girl's revenge on a company for the death of her father, but instead went terribly wrong, killing thousands of people. The story and artwork is very strong, except for the fact that a few characters look very alike, but that aside and I heartily recommend it. 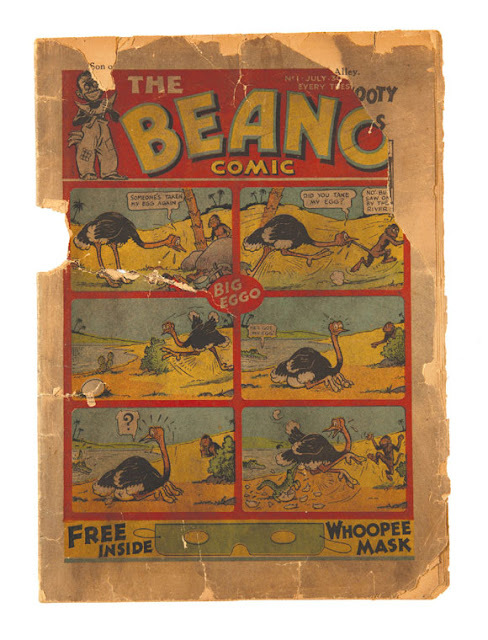 Buster swallowed up a lot of comics in its time - a whopping twelve different titles in total. 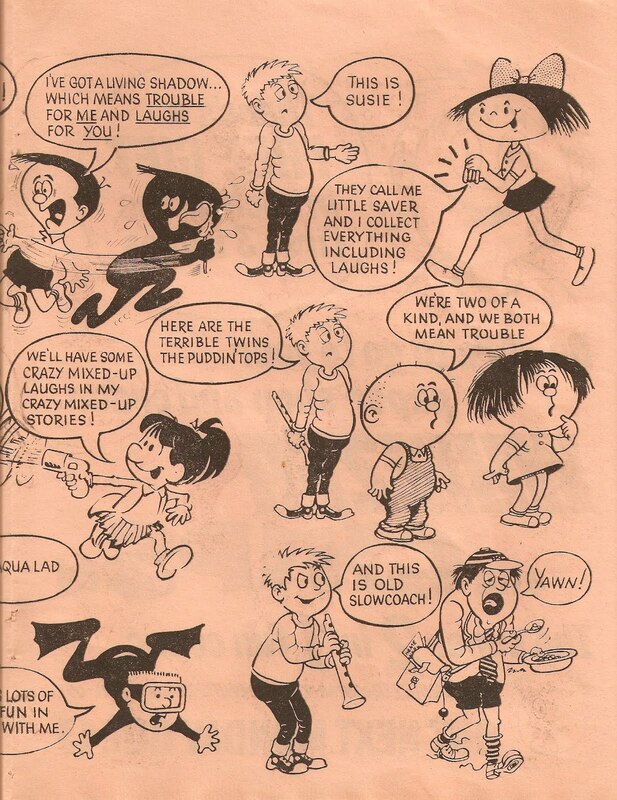 Radio Fun was the first comic to merge and did so very early on in Buster's life on 25th February 1961. 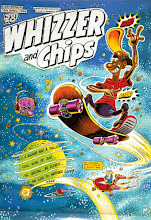 The last one, Whizzer and Chips, merged in 1990, and helped Buster push on through its tough last decade. 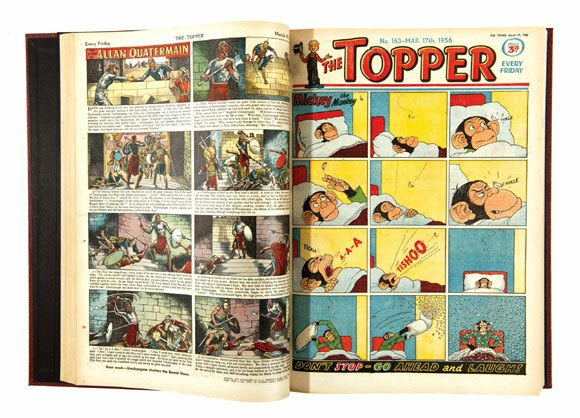 Whereas I do own copies of a few other of Buster's mergers, the one I'm going to be concentrating on today is Nipper. 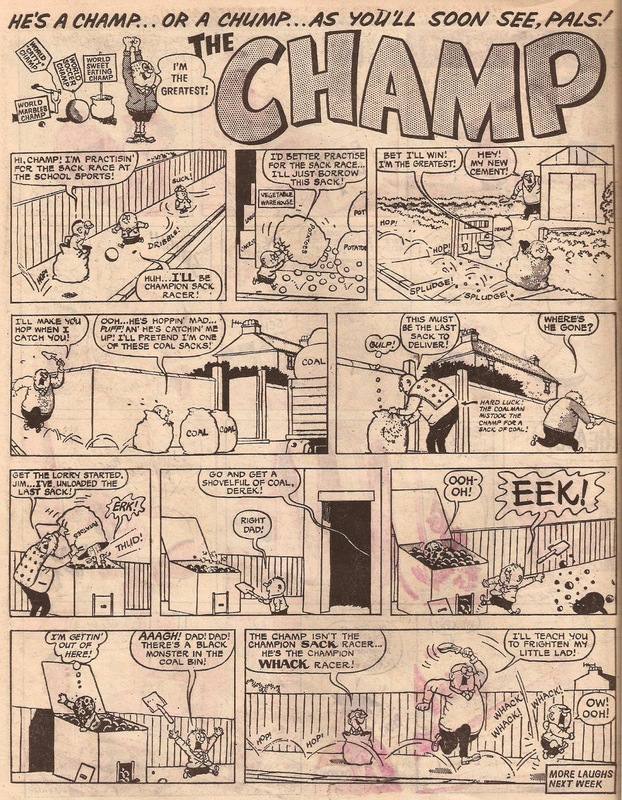 Nipper started life as a small A5 sized comic (hence the name 'Nipper') on 31st January 1987, and lasted for a mere 16 issues. 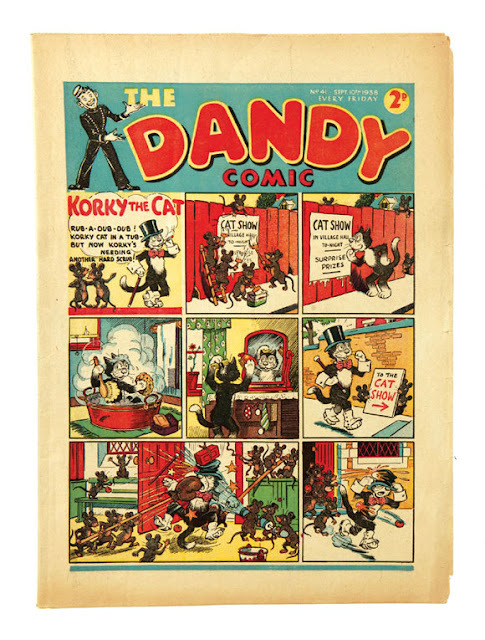 By the end of its run the comic had increased in size to a standard A4 cover, and had decreased its page count from 48 to 32. 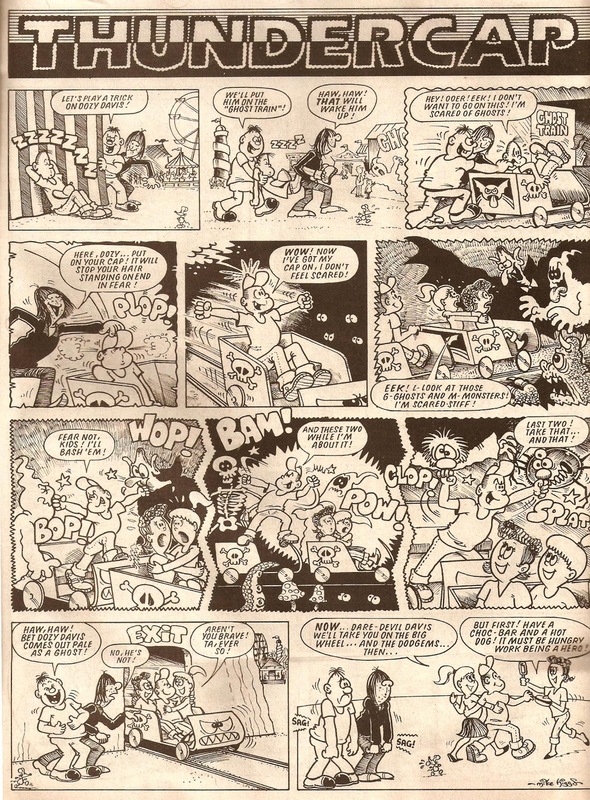 The comic was aimed at a much younger audience than other Fleetway titles, with strips such as Nursery Crimes, Will and Bill and even Nipper himself making that obvious. 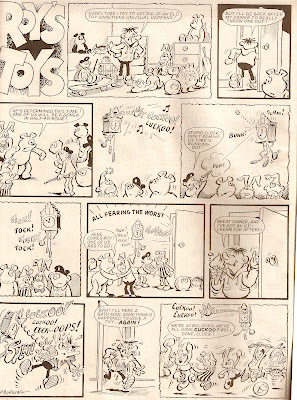 Although Nipper did have some good artists working within its pages, such as Tom Paterson, Anthony Hutchings and Terry Bave, it still failed to take off, proving that quality isn't always the key to success (although it probably is a big part of it). 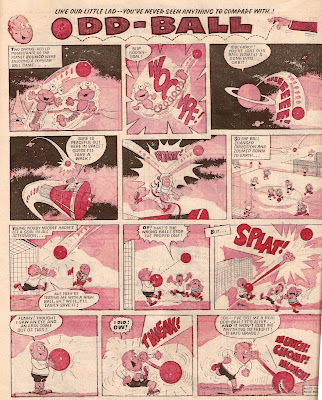 After one revamp Fleetway quickly gave up, and it merged with Buster on issue dated 19th September 1987. 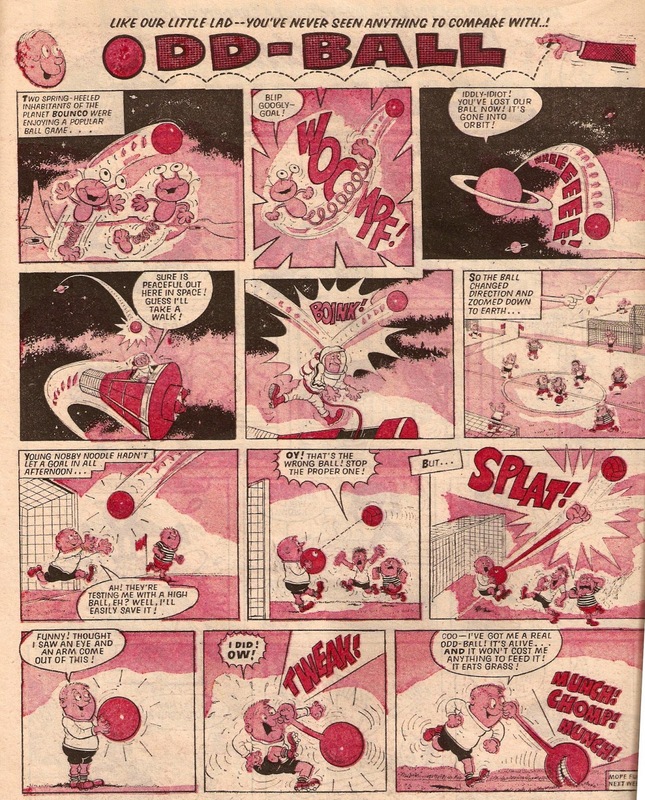 The bright cover showed Nipper's stars chasing Madballs, which were characters from a video game that was offered as a prize for a competition inside. As the cover mentions, there were 26 strips crammed into 32 pages, so there was no wasted space - I don't know how they managed to fit everything in! 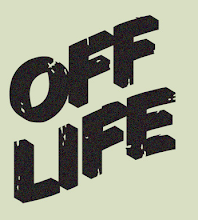 Actually, they couldn't, and some strips were removed from this issue, such as Prambo, Nice Life and Good Guy, all of which were due to return the following week. 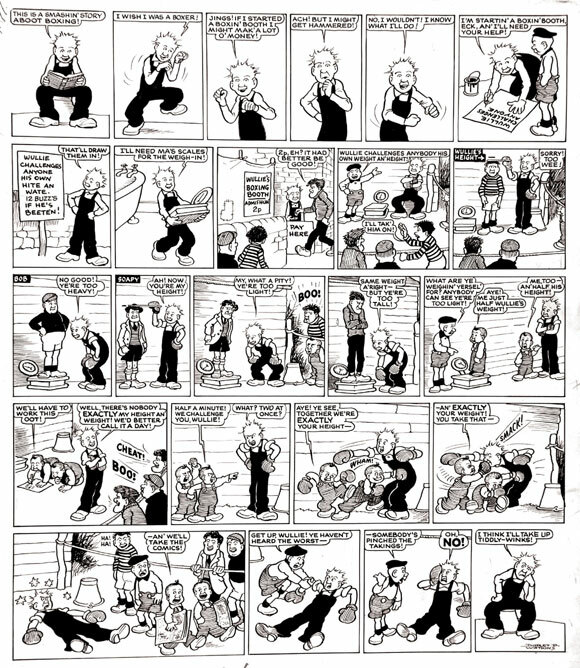 Of all the characters that begun life in Nipper, only a few are remembered. Nipper himself is an obvious one, plus Brad Break and Ricky Rainbow, but sadly that's it. Thundercap is one of the highlights in Buster. 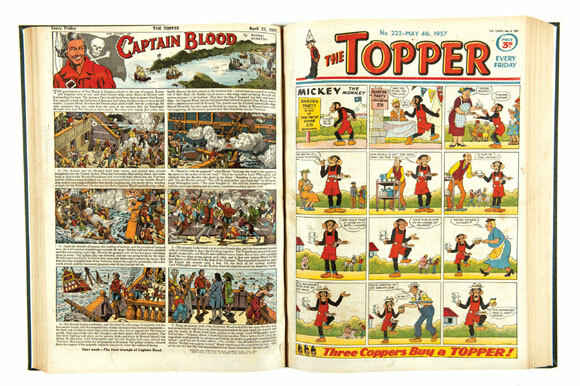 However, if you ever get the opportunity to grab yourself some Nipper comics - do so! There's some good stuff in them by some great artists. Time to head back to 11th October 1986, and take a look at the X-Ray Specs strip that appeared on the back of the Buster comic with the same date. This particular episode, as well as being special for appearing on the back cover and in full colour, stands out for a very different reason - it stars Mike Lacey. To view it in maximum size click on the image, and then click it again! 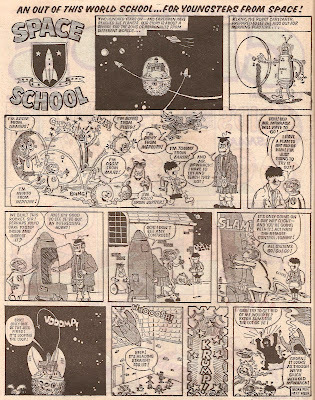 Plus, if you look closely at his drawing board in the panel below, you can just about make out X-Ray Specs written on it! 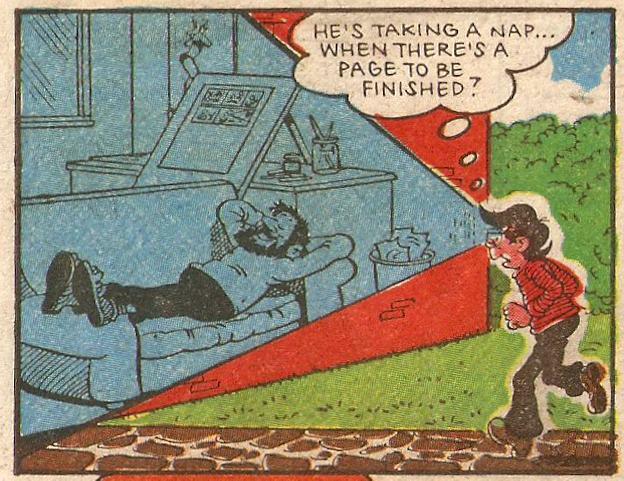 Although it wasn't too common, artists did sometimes draw themselves in strips. Over on Kazoop Irmantas did cover a good selection of these, but one of my favourites in Tom Paterson in Buster. 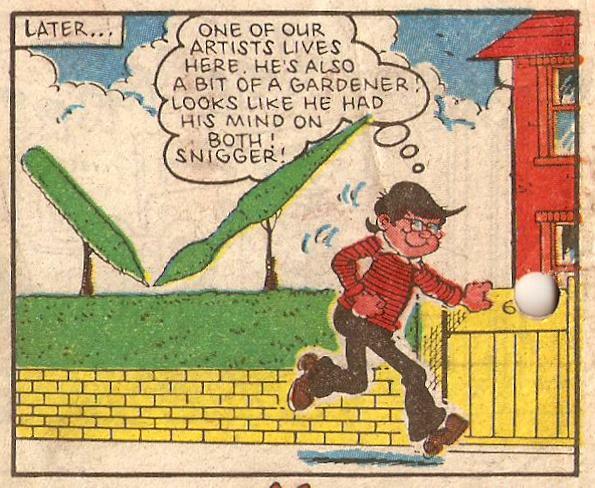 One panel shows the editor of Buster knocking Tom's wage off the table - about three or four coins, followed by showing him in a tiny, messy house. If I can find it I'll post it. And if you're going to try and hunt down this issue, here's the front cover you should be looking for! The Return of Sexton Blake! 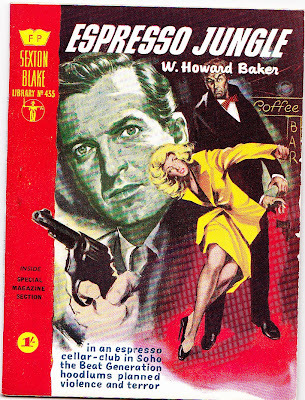 Sexton Blake, the "poor man's Sherlock Holmes", is due for a comeback as the license to the character has been sold by IPC Media to Obverse Books, who plan to revive the Sexton Blake Library, starting with a novel by George Mann, who has written several Doctor Who books. "I fell in love with the saga of Sexton Blake many many years ago, when I first happened upon 'The House of the Hanging Sword' by Gwyn Evans. Ever since reading that very first story I've known I wanted to write for this character, and hearing the outlandish tales of those who did, you could almost believe they were fictional characters in their own right. It's a club I'm honoured to be able to join, and it's a bit of a dream job to be the person charged with writing the first official issue of the Sexton Blake Library for almost 50 years." 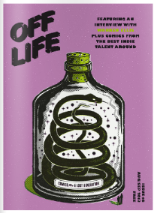 Although there's no date yet as to when the first books will be released, Obverse books have said that they will be in hardback and electronic forms, so there's something to suit everybody. 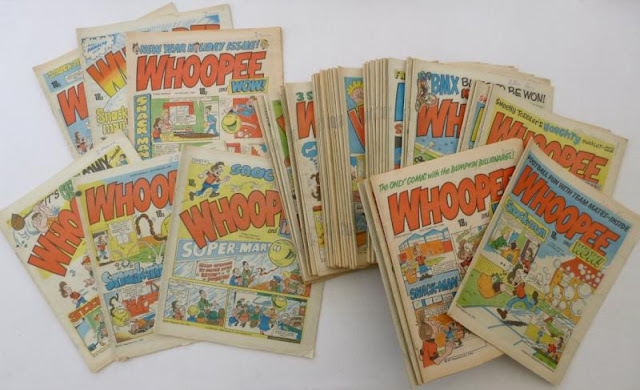 200 separate auctions have been put up on ebay by comics dealer Phil Shrimpton, better known as Phil-Comics. Here is some of the best stuff. 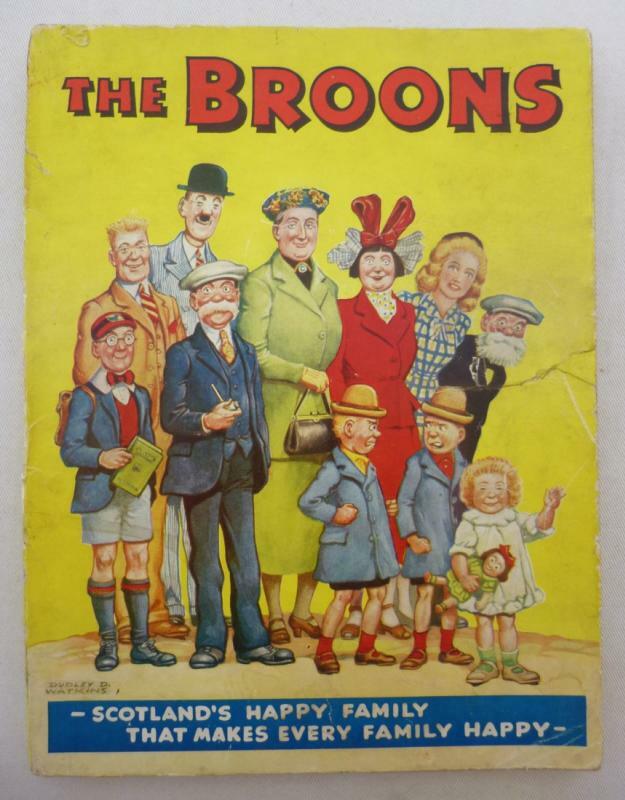 The first thing that caught my eye when looking through was this very early Broons book from 1949. This is the fourth Broon annual and is very rare; already bidding has reached £100! 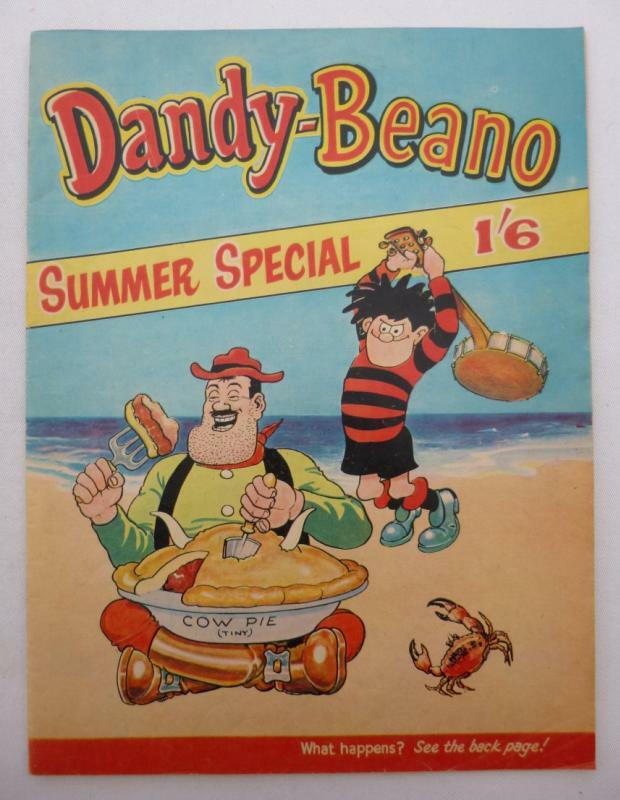 Next up is the 1963 Beano summer special, in fine - near mint condition! One in similar condition sold for £1,371 back in 2010, and going by the condition of this one I wouldn't be surprised if it sold for a similar amount - if not more. Saying that, I don't know how many people are willing to pay that much, maybe the one person who was has already got one. There are some fantastic photos of this one so I'd recommend you check them out. 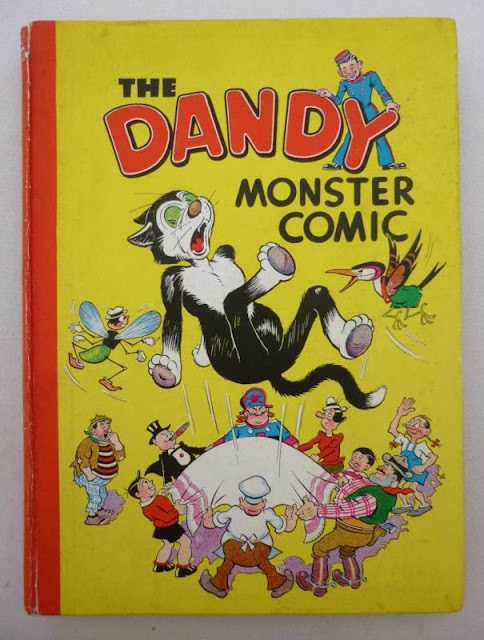 Also in great condition is this Dandy Monster Annual from 1947, which has been graded fine - fine + condition. One thing I'd really like but is probably going to shoot up in price is this bound volume of Jag, with issues is VG to Fine condition. 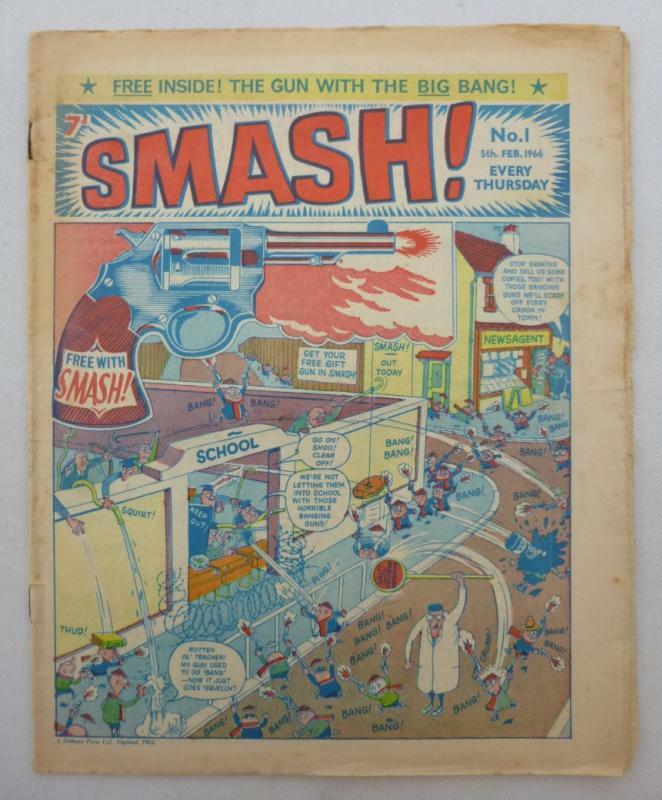 And finally the first issue of Smash, in VG- condition. So far only one bid has been placed, but I suspect there will be a few more. As I've said there are 200 auctions up right now, with bidding ending on Sunday 2nd and Monday 3rd June, so you've got plenty of time to look through them! 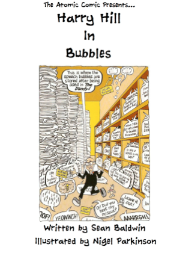 Here is a link to take you to the home page to browse through all of his comics currently online. A brand new Compal Comics catalogue has gone online, and there are a lot of goodies in this one! 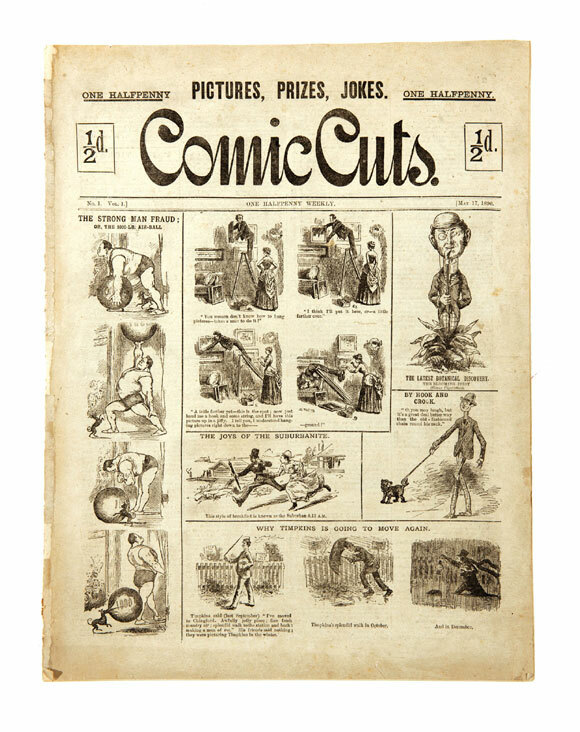 The very first auction is for the very first issue of Comic Cuts, which is apparently very rare with only eight known copies in existence, although I'm sure Compal have sold lots of them! 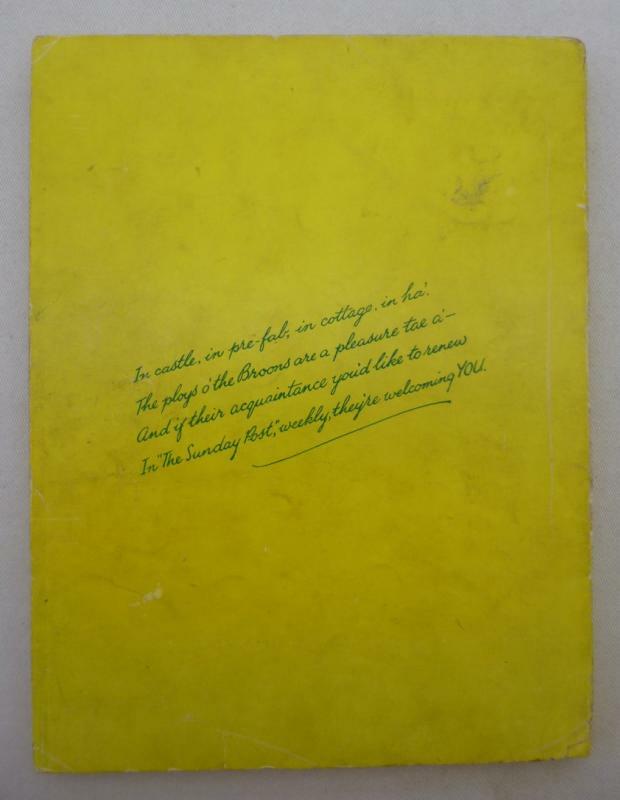 It has an estimate of £200 - £250 and is in VG condition. 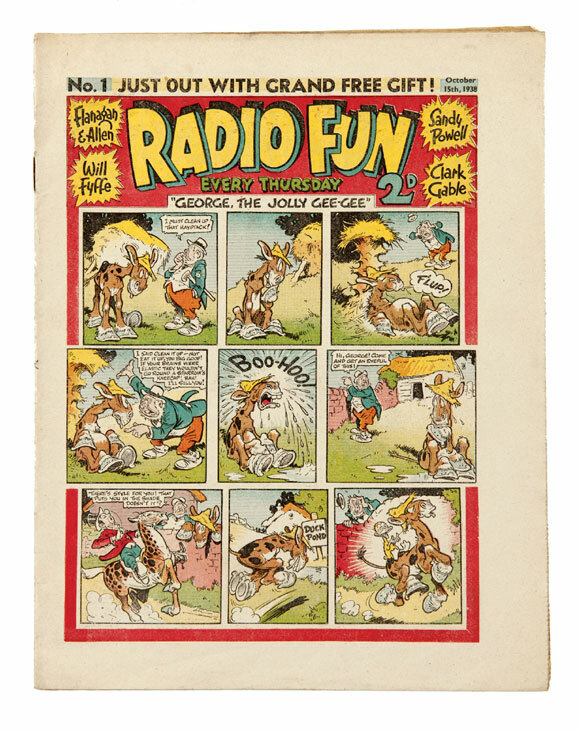 At auction #5 is the highest graded copy of Radio Fun issue one known to exist, in very fine condition! With George The Jolly Gee-Gee having fun on the bright front cover, this Beano challenger is expected to sell for anywhere in-between £250 - £300. 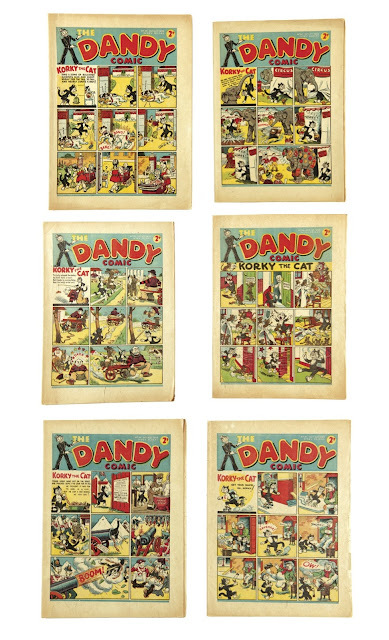 And at lot number 7 is some very early original Desperate Dan artwork by Dudley D. Watkins, which appeared in issue four of The Dandy. Next up is a selection of early Dandy comics, from issue #41 - #47 (1938) in auctions #8 - #14. 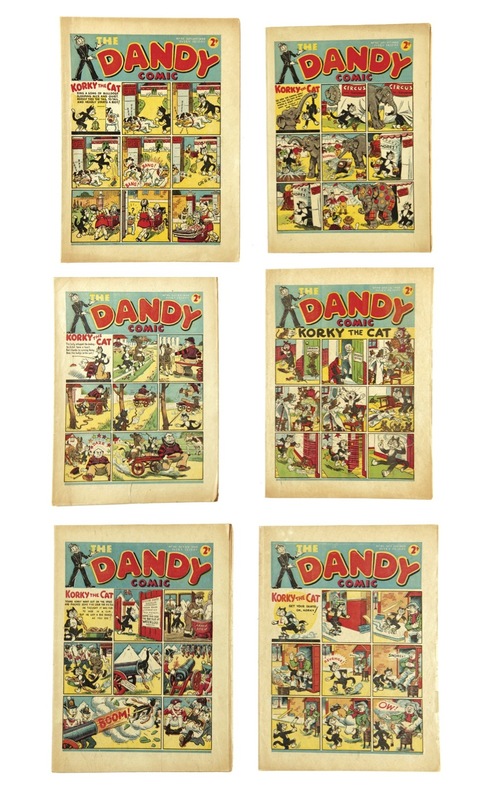 Each comic is in FN (fine) condition, and each has an estimate of somewhere between £70 - 150. 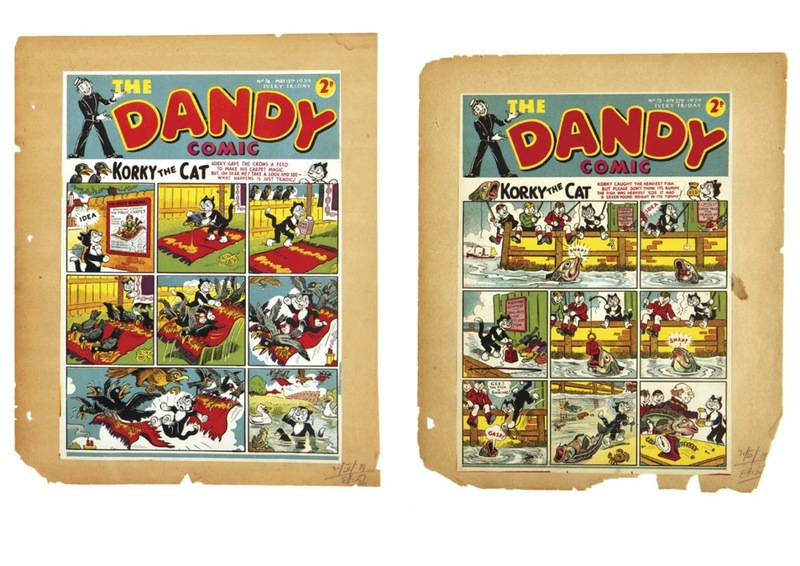 Between lots 15 and 22 are six front cover printers proofs for The Dandy, and have a signature of approval from Dandy editor Albert Barnes. Here are my two favourites. 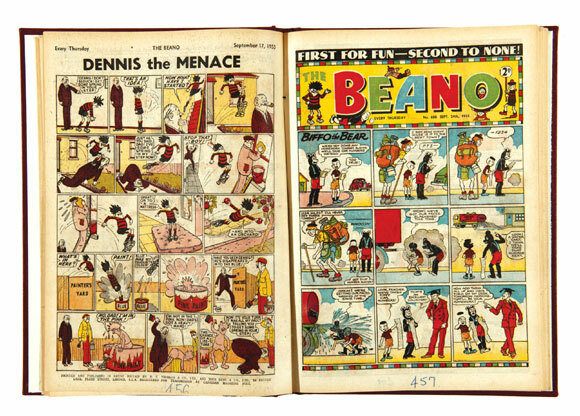 At lot number 27 is the very first Beano comic in very rough shape. 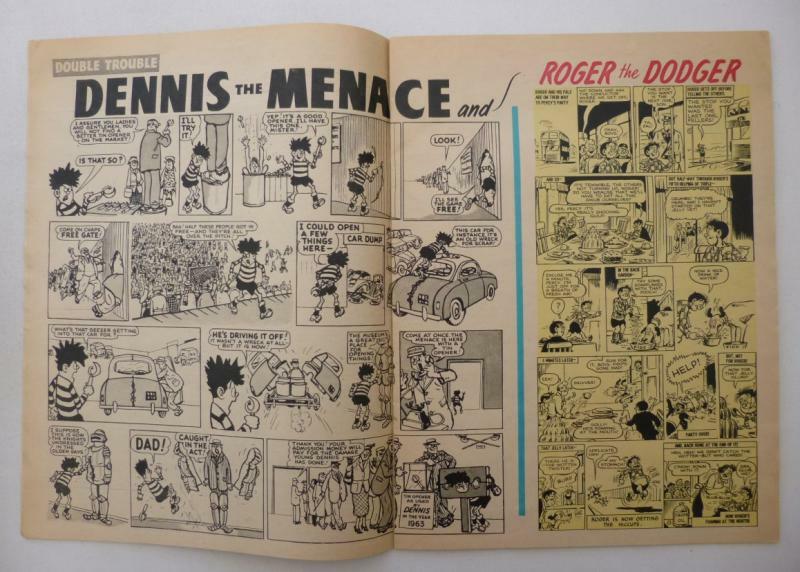 This exact same comic sold for £786 back in the spring 2012 catalogue (which I covered here). Let's see if it does any better this time. 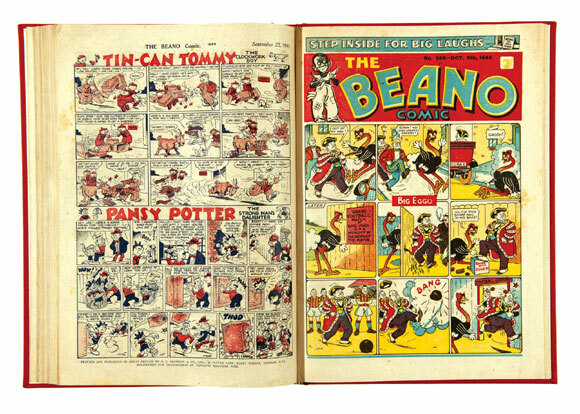 Two early Beano books are available, the 1942 book in good condition and the 1944 Magic Beano in fair condition. 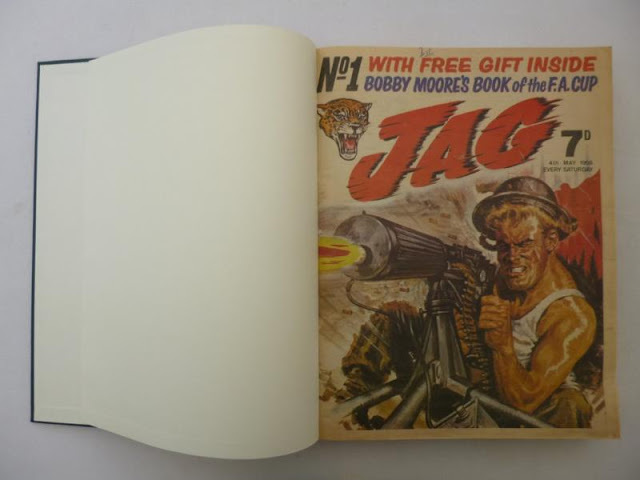 There are also a few bound volumes of early and war time Beano comics, all of which are extremely scarce and are expected to fetch very high prices, and a selection of bound volumes from the 50's. 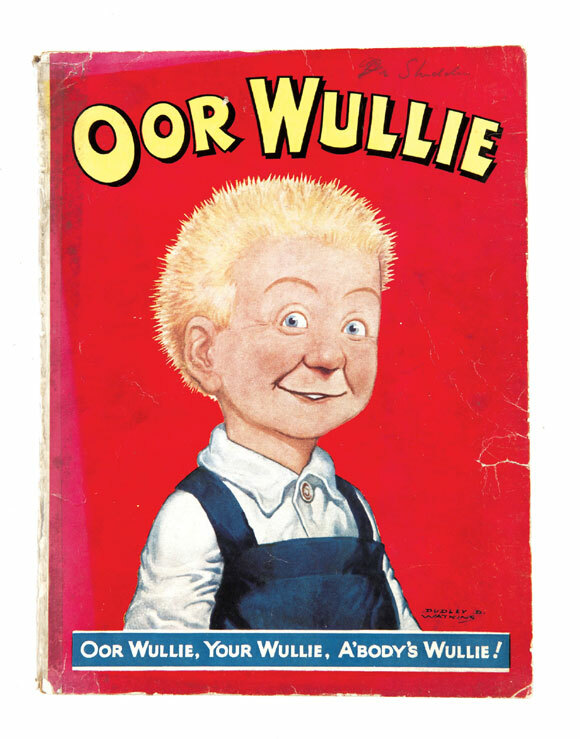 At lot #61 is the 1951 Oor Wullie book, which is very collectable, and, in very good condition, is expected to go under the hammer for £200 - £250. 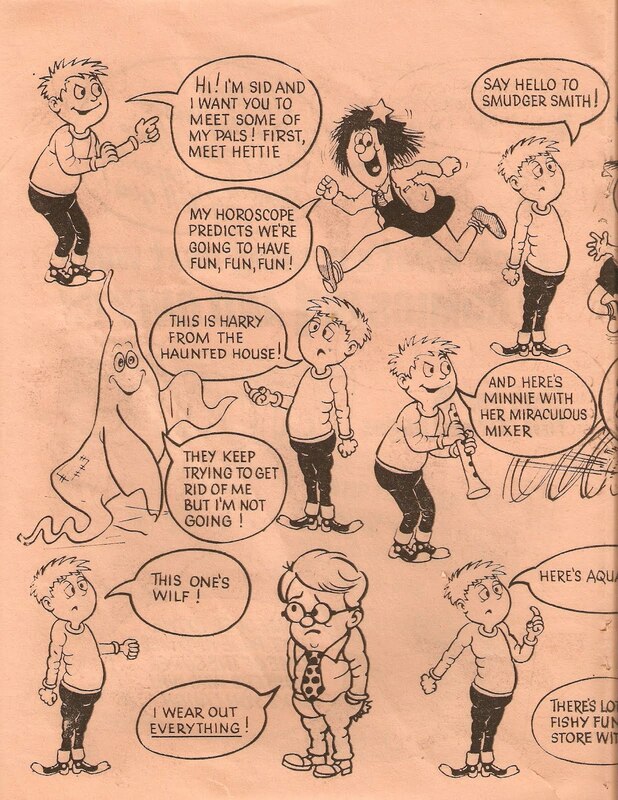 This was followed by some original Oor Wullie artwork by Dudley Watkins. 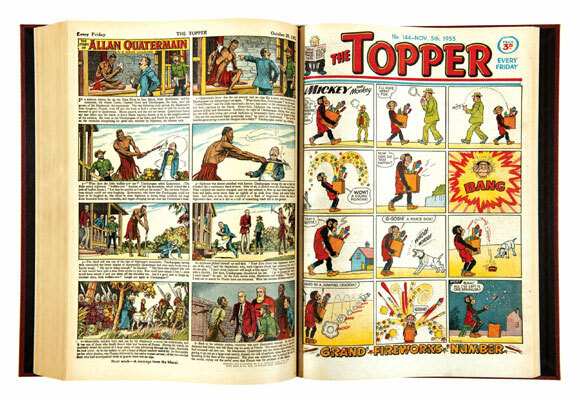 And there are also some bound volumes of Topper comics, with some comics reaching near mint condition! 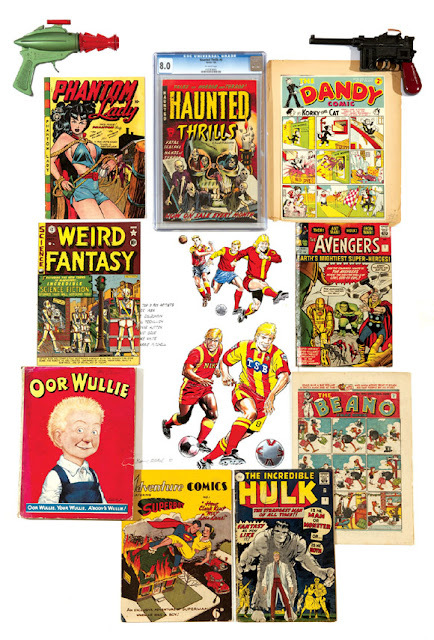 This is just a small selection of the comics from the British comics section, and there are lots more in the American section as well, so be sure to check it out - there are 325 lots in total! Even if you're not going to buy, it's still very interesting to look through. This Week In... 1990 - Buster! A FREE Beano Summer Special in Tomorrow's Beano! This Week In... 1961 - Eagle!